As you travel at 110kms along the new Urunga bypass,spare a thought for the travellers of bygone years, because in 1888 it was a much slower journey. 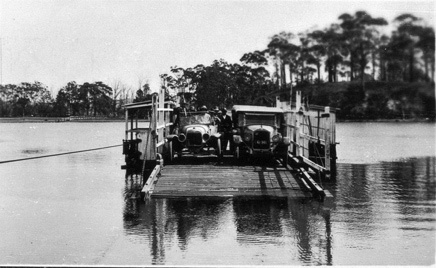 At this time there were only three ferries available for crossing the Bellinger River’s North and South arm (now called the Kalang River). One was at Fernmount, one at Raleigh and one at Urunga (the South Arm), the latter being on the mail route to the Macleay and had the greatest amount of traffic1. By 1911 tempers were on the rise about the ferry service and a meeting was called on the 31st March 1911 at the Urunga Hotel with the Minister for Works (Mr Griffith) and a deputation of residents, to discuss the problems associated with the ferry crossings. The Minister was presented with a signed petition asking the Minister for an oil launch to be put on the ferries at South Arm and Raleigh. Mr Arnold, a spokesman for the community, pointed out that “great inconvenience and delay were caused through the slowness of the ferries” 2. 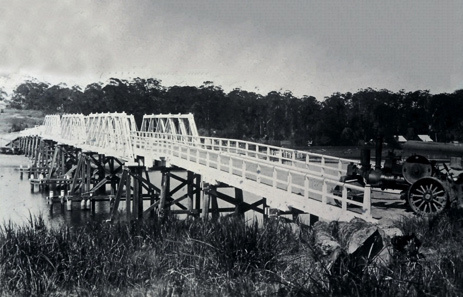 By 1925 the members of the Bellingen Chamber of Commerce are wholeheartedly behind the Urunga Progress Association in the endeavour to secure a bridge over the South Arm. Mr W J Hammond (President of the Bellingen Chamber of Commerce) said that for 30 years, to his knowledge, the agitation had been going on. He said “the present punt service was a disgrace, it was antediluvian and shocking inconvenience was occasioned to persons who were obliged to use the road”3 He instanced one delay recently when a doctor, hurrying to an urgent call from the other side of the river, was held up from 5am till 1 pm through a breakdown of the punt. By 1928 the battle was won and the Urunga Ferry contract for working of the punt expired on the 30 June 1928. On September 29 1928 the punt was replaced by a timber bridge built by the Department of Main Road at a cost of $19,000. The Engineer (Mr Baird) broke the ribbon at the entrance and drove his car over the bridge. He had with him Mrs Gale (wife of the Bellingen Shire President) and Mesdames Atherton and Bushell, two of the oldest residents of the Bellinger. It was noted that the ceremonies were not elaborate, as the Shire Clerk, Mr Witt put it “it was a case of no champagne by request as the Council is rather hard up at present”. The Raleigh Sun reported on the 2 October 1928 that the opening was an important Milestone in the progress of the district. 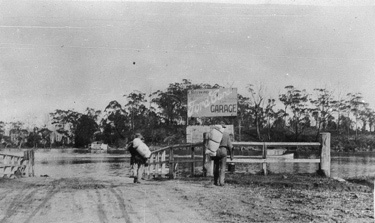 Mr Gale (the Shire President), in a fine speech, expressed the wish that it would not be long before another bridge at Raleigh would be on its way and that, with the bridges to be built over the Nambucca at Macksville and over the Clarence at Grafton, there would be no more punts to cross for hundreds of miles along the main North Coast road4. The bridge transformed the trip in 1928 but was eventually replaced by a new bridge in March 1972 at a cost $1.13 million. The Minister of highways, the Hon P Morton, in his opening address, said that the new bridge was an example of the recent trend to avoid visual pollution. He added that this was as it should be in conformity with the beautiful district and a shire which was full of contrasts of scenery, which made it a delightful mecca for the tourist. There are many more stories about the history of the Bellinger Valley available at the Bellingen and Urunga Museums. If you would like to become involved in the Bellinger Valley Historical Society as a volunteer or a Friend of the Museum please call Susan 0418415032 or drop in to either of our Museums. Also visitors to the Bellingen Museum can view the collection of the Museum for a gold coin donation during the upgrading of the Museum.